I know it's been ages since I last updated with anything but I got busy with stuff and kind of forgot about this place Inspiration has been rare lately but for all of you who aren't on deviantArt.com you probably haven't seen these. Darth Maul, using the "speed painting" technique. Aaaand a female Scout Trooper! At the moment I'm reading Order 66 by Karen Traviss, and of course watching the Clone Wars series. They make me want to draw more Star Wars so you can expect more to come soon! A quick sketch on Photoshop to see how a smart looking black human female would be in mando armor! how about a female mando who looks really cute? Quick sketch? Your quick sketches are much better than many of my final pieces. Deanna, after our little conversation I had to look at the stuff you do. At the risk of repeating what everyone else said, you're awesome. I love your style. Wow! Daenna!! Your one of the greatest artists on BFFC! You and Terra should collaborate as the two BFFC artists and create a Boba Fett picture together! Honestly! I would absolutly LOVE to see a picture you two did together! Daenna I love your style, specificly your Darth Maul picture. Simplicity is Bliss. i wonder why i never saw this thread before, this art is too awesome to behold. Maybe if you scavenge through the junkheaps of threads from the past, you'll be surprised with what you find. I urge and INSIST that this thread continue to survive...............this artwork is too valuable to be left behind. Hey guys and sorry for not really keeping up with this community. I've been really super busy lately and I wish I could have longer days (about 35 hours, I'm not picky) to fulfill my millions of hobbies. A gift for Degan, a really cool looking Mando lady. You might have met her, she wears gray and yellow. Getting all hyped up about The Old Republic. Some pretty sweet stuff. Specially like that Old Republic one, I like how you got a lot of detail in there. Official Topps "Star Wars Galaxy Series 6" Sketch Card of the character I created, Lucas McCoy by LFL artist Shea Standefer. That's actually pretty cool. Did you get a copy of the card yourself? McCoy, she's a fan of yours, huh? They're a one of a kind, random find in a Topps pack of these cards. Whoever bought mine did in fact put it on ebay and I was able to outbid 6 other people for the card, thankfully. Deanna, love the mando strike team. 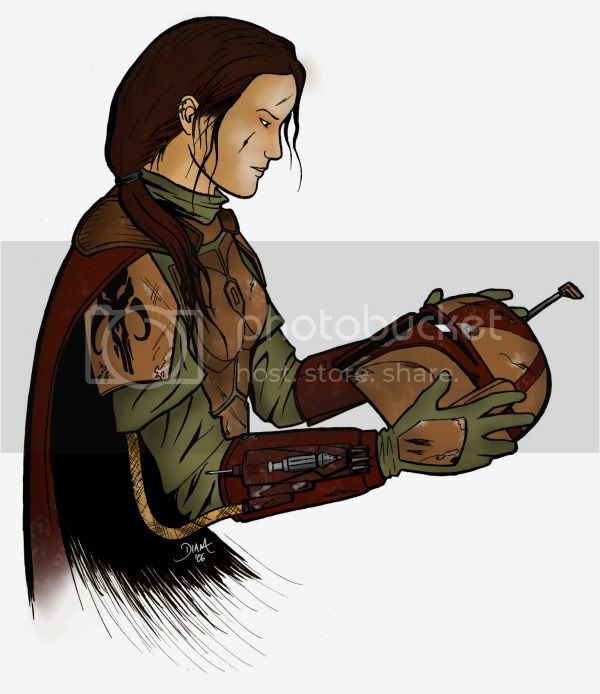 I have a background story for the fan comic that could include your mando girl since there's at least three other female mandos in it. Tell me what you think. Wait, Triple Zero and Hard Contact are about Mandalorians? That was my thought. As far as I knew Triple Zero's about Clones, so the picture couldn't be from the book. But then I never read Triple Zero.